Skywatcher Tunc Tezel took this image of the night sky atop La Palma in the Canary Islands on a night with no moon and at a time when the milky way would not create much skyglow. Multiple exposures are taken to create enough light. This image captures a magnificent glow of the night sky. The stunning photo was taken by skywatcher Tunc Tezel from the island of La Palma in the Canary Islands. La Palma is well-known by astronomers because it houses one of the most complete observatories in the world, the Roque de los Muchachos Astrophysics Observatory in Garafía. Cloudless skies and clear weather make the location ideal for stargazing. Tezel took the image on a night with no moon and at a time when the milky way would not create much skyglow. Multiple exposures are taken to create enough light in the photo. 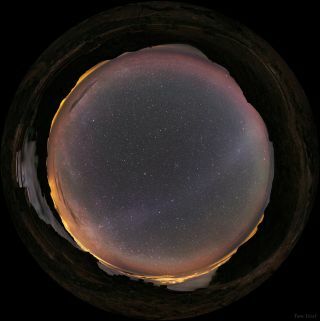 "I had long intended to make a northern counterpart image of this all-sky image taken by my TWAN colleague Stéphane Guisard in Chile, " Tezel wrote on his website. "La Palma lies one to two degrees too far north of the optimum latitude (27 degrees North) but thanks to the clear skies and high altitude I was successful." Skyglow, commonly called light pollution, is the illumination of the night sky typically through artificial light. Skyglow prevents many of us from seeing some of the stars that dot our night sky. It can also be caused by other stellar objects that emit light. Much of the light in this image is created by skyglow from the milky way as well as light from urban areas. La Palma is famed for its lack of skyglow and clear skies that provide stunning views of the night sky. In the image, a faint band of light can be seen running through the middle. This band is caused by zodiacal glow, a whitish glow caused by sunlight scattered on space dust. The brighter region of the band is an area of scattered light directly opposite the sun. This region is known as Gegenschein (German for "counter glow") and can sometimes be seen with the naked eye under very dark skies. Zodiacal glow is so faint that even a small amount of light pollution makes it difficult to see. While the breathtaking view provides a rare glimpse of a hard-to-see sky, creating the image was a time-consuming task for Tezel. "Creating this all-sky picture took a week to construct, process, and clean. The picture consists of 32 separate shots making a 190-megapixel monster," Tezel wrote.